When I read Neil Gaiman’s Snow, Glass, Apples a few years back, I declared it to be one of my most favorite short stories ever. In fact, if I were to name just one favorite Gaiman short story, that would be it. I’ve always enjoyed reading Gaiman’s retellings (Snow, Glass, Apples is a retelling of the classic fairy tale, Snow White and the Seven Dwarfs, told from the point of view of the Wicked Stepmother) so when this book came out, I was ecstatic. 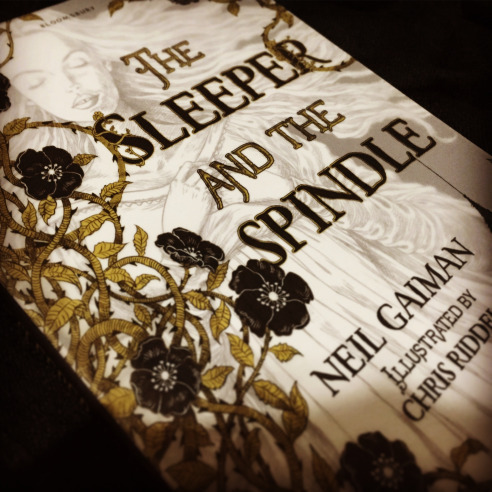 The Sleeper and The Spindle not only re-imagines the tales of Snow White and Sleeping Beauty – refreshed your memory already? – it also expertly weaves their stories together so that they could share the spotlight. In this story where character “names are scarce,” a queen embarks on a journey to a kingdom beyond impregnable mountain barriers to rescue a young princess from black magic. Okay, yes, back up. I did indeed type “queen” in there, and then “princess” thereafter. So yes, you read right. This queen, in fact, is accompanied by three dwarfs on her journey. Intrigued? This retelling is an adult tale. I cannot imagine this being read by youngsters without them vehemently or violently expressing their objections at some parts. The magic is there, yes – the enchantment and the spells and the curses, but this time leaning more towards the dark side of it. You would never imagine the well-loved princesses of fairy tales depicted the way they were in this story, which, for me, is simply fascinating.